This basic sailing course is designed for beginners with no sailing experience. The classroom instruction begins with an emphasis on safety and the theory of how sails work. The rest of the course follows the process of “going sailing”, and covers maintenance, rigging, launching, sailing upwind and downwind, starting and stopping, right-of-way, and docking. Each student then receives on the water training to solidify their skills. The fee for this class is $200. For an additional $100 you may bring a spouse/family member/a friend/significant other, etc...you get the drift. Learn something new together! Register here by clicking on the button or from a Tuesday class from the calendar to register. Registration and payment are required in advance. Remember you can bring a buddy for an extra $100. This basic racing course is designed for beginners with limited sailing / racing experience. The classroom instruction begins with an emphasis on safety and the racing rules. 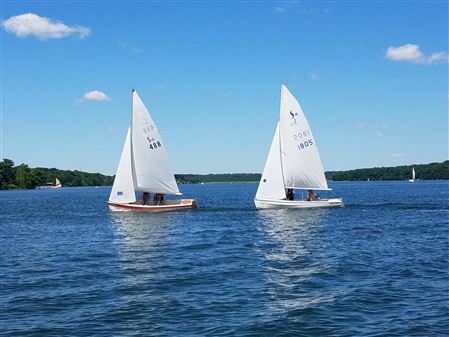 The rest of the course follows the process of “smart sailing”, and covers racing tactics. Each student then receives "on the water" training to solidify their skills. Fees to be determined. ****Note: "On the Water" Training Days are subject to rescheduling due to wind and weather conditions. Due to the holiday weekends, the Saturday on-water-training days are flexible. Please let us know what days or evenings will work for you. Bring a family member or a friend with you. Only $100.00 extra.